Are there any countries with no elections at all? Regardless of other restrictions (only men, only one party, etc. ), this map seems to show every single country in the world has some form of elections. Is there any country with no elections at all? See also: Are there countries considered socialist that do NOT have parlaments and elections? Oman is kind of an edge case. You can make arguments that it has elections, and arguments that it does not - the actual process is caucuses selecting representatives, and Sultan appointing them; and the parliamentary body has no true legislative powers either. Saudi Arabia only has municipal level elections, but not country level. Somalia didn't have elections between 1980 and 2012. No longer true as they held an election in 2012. UAE (United Arab Emirates) is another reason to quibble. The Federal National Council (al-Majlis al-Watani al-Ittihadi) is the UAE’s legislative body and consists of 40 members. Half are appointed by the rulers of their respective emirates, and hold all of the council's political power. The other half, who have only advisory tasks and serve two-year terms, are elected by a 6,689-member electoral college whose members are appointed by the emirates. Under the 1959 constitution there was an elected Legislative Council (Malay: Majlis Mesyuarat Negera), but only one election has ever been held, in 1962. Soon after that election, the assembly was dissolved following the declaration of a state of emergency, which saw the banning of the Brunei People's Party. In 1970 the Council was changed to an appointed body by decree of the Sultan. In 2004 the Sultan announced that for the next parliament, fifteen of the 20 seats would be elected. However, no date for the election has been set. I want to add something to the excellent answer by DVK. Vatican has no elections. The city officials are appointed by the Pope, who is elected by cardinals. The cardinals it turn are appointed by the pope. Antarctica is governed by the Antarctic Treaty System. Its administration, the Antarctic Treaty Secretariat located in Buenos Aires is headed by Executive Secretary. He is appointed for a four-year term by the foreign powers, who are signatories to the treaty, at Antarctic Treaty Consultative Meetings. Eritrea hasn't had any elections practically since its independence in 1991. 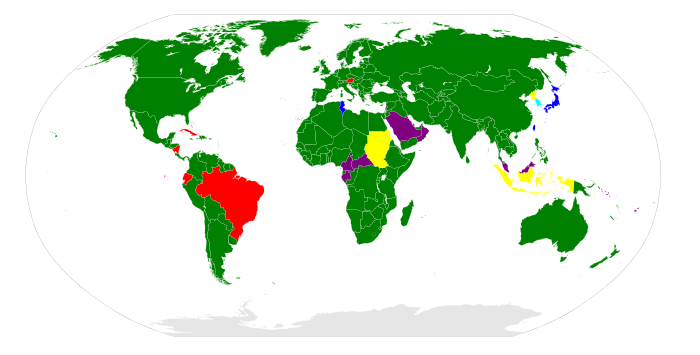 Are there countries considered socialist that do NOT have parliaments and elections? Why are there so many unscheduled/premature elections in Israel? Are there any countries where non-citizen can become president? Are there limits for participation in elections in the US? Are there any benefits to random voting? Are there any countries that require political parties to be democratically organised (and accept members)? Are there countries with upper age limits for voters or candidates? Why are there only 36 US states with governor elections this November?